Special Containment Procedures: SCP-2821 must be monitored on a constant basis for any changes in behavior and size. Geiger counters and cameras are to be lined throughout the chamber, with two Minkowski Spacetime Monitors set up within a 0.5 kilometer distance around SCP-2821's chamber. The tunnel leading from Lunar Area-32 to SCP-2821 is to be maintained and routinely checked for radiation. Two airlocks coated with lead foil are placed at the entrance of the tunnel and the midway point of it to prevent contamination of Lunar Area-32 from gamma rays and decaying isotopes. The cover above the hole from the lunar surface to SCP-2821's chamber should resemble the lunar landscape to reduce risk of discovery from cameras. This cover should be made of heat absorbing materials to match the temperature of the surrounding surface. Transmissions of any sort from SCP-2821 must be reported to Level 4/2821 researchers immediately, along with any possible signs of communication. Non-Foundation personnel that detect these transmissions will be interrogated and administered amnestics. Description: SCP-2821 is a spherical spatial anomaly, theorized to be a true vacuum1, located 1.25 km from Lunar Area-32 in a spherical cavern with a diameter of 0.9 km. The size of SCP-2821 changes erratically at the speed of light, though it currently has a diameter of ~0.55 km. Any objects entering SCP-2821 will become subject to the current laws of physics within the anomaly, which change at random intervals2, often causing the destruction of said object. At times objects can be seen forming or moving around within SCP-2821, labeled SCP-2821-1 instances. Occasionally SCP-2821-1 instances have left SCP-2821, often breaking apart into various radioactive isotopes and particles. One central entity can be seen within the anomaly, labeled SCP-2821-2. This entity appears as a mass of rapidly flashing colors, with occasional tendrils coming out of it, and has remained permanently in the center of SCP-2821 since its discovery. It is theorized that SCP-2821-2 is either the cause of the anomaly or is preventing its expansion. Occasionally radio transmissions are detected coming from SCP-2821. A majority of these radio transmission are static, though some contain speech from an unknown individual and miscellaneous noises. The length and times at which these transmissions occur are random, though some of their content has similar themes. Investigation into this is in progress. SCP-2821 was discovered during tunneling from Lunar Area-32 to Lunar Area-13, which would have served as a means of transportation between the two sites. On 13/4/2015, after digging 1.25 km from Area-32, a piece of mining equipment fell into a large cavern containing SCP-2821. At this point the cavern had a diameter of 0.8 km, and SCP-2821's size was fluctuating at a rapid rate. During the ensuing investigation and development of containment procedures SCP-2821 reached a diameter of 0.3 km for a day, before reaching 0.9 km, creating the current cavern size and creating a hole to the lunar surface. This investigation led to the current accepted theory of this being a true vacuum. If SCP-2821 were to begin expanding at the rate dictated in quantum field theory, it would lead to a VK-Class reality restructuring event3, with anything entering the anomaly following its new laws of physics and chemistry. As it takes 1.3 seconds for light to travel from the Earth to the moon and vice versa, both the moon and Earth would be destroyed before the Foundation could take a course of action. After ~6 hours most of the solar system would be destroyed. As the size of SCP-2821 changes at random, this could occur at any given time. Addendum-1: Below is a table detailing physics seen in SCP-2821, each designated with φ and a number. This only lists the longest lasting and important physics states. A full document of all recorded states and further information can be seen in Document SCP-2821-V1. Addendum-2: On 15/9/2016 a radio transmission originating from SCP-2821 was detected. The transmission was four minutes long, with audio composed of static, multiple languages, and miscellaneous noises. Known languages used are Spanish, Icelandic, Yiddish, Scottish Gaelic, Ortothan, and Esperanto. Below is a mostly translated transcript of the transmission. Words that have no exact translation to English are in brackets along with any sounds or unknown words. Capitalized sentences show any loud portions of the transmission. A diagram representing general metastability. 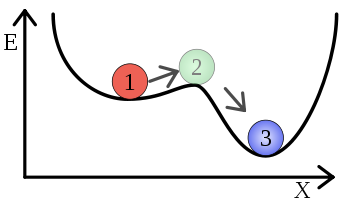 In this scenario, 1 represents the Higgs field in a false vacuum, 2 represents the field on the verge of transition, and 3 represents the Higgs field in a newly formed true vacuum. At this point the field would have the lowest potential energy. According to quantum field theory, a vacuum refers to space with as little energy as possible in it. As quantum fields still exist, by removing as much energy as possible creates a false vacuum, which does not have the global possible minimum of energy. The global minimum of energy would be a true vacuum, though there would be a barrier to reaching such a state. This makes a false vacuum metastable, as it could get past the barrier and "fall" to the lowest energy levels if certain energy requirements were met. It is theorized that our universe exists as a long-lived false vacuum on the border of stability, based on the mass of the top quark and Higgs boson, an extension of the Higgs field which gives particles interacting with its mass. If an event such as quantum tunneling occurs with the Higgs field, where a particle could "tunnel" past a barrier, the result of the Higgs field reaching the lowest energy level would create a true vacuum. The true vacuum would be a bubble expanding in all directions at the speed of light, destroying anything that comes in contact with it. The inside of the true vacuum would operate under entirely different laws of chemistry and physics than the universe. In short, a true vacuum is a region of space at the lowest possible energy level, expanding at the speed of light. Said region would operate under different laws of chemistry and physics, leading to the destruction of anything entering it. 2. The longest lasting and most important ones are detailed in Addendum-1. 3. An event where the universe's existing physical laws are altered to new anomalous laws. 4. Refer to the documents "Proposal for the Proper Containment of SCP-2821" and "Project Heisenberg-Stiriacus Overview" for further information. 5. This decrease in momentum was likely the result of particle movement decreasing as the temperature got colder, which stops entirely at 0 Kelvin or absolute zero. 7. Mathematical roulette curves, typically drawn with a spirograph. 8. Redshift is an effect in physics where light coming from an object increases in wavelength towards the red end of the spectrum, which occurs when an object is moving farther away from the viewer. This is caused by light coming from the object taking longer to reach the viewer as it moves away. The opposite of this with an object heading towards the viewer is known as blueshift. 9. A fractal made of equilateral triangles. 10. A majority of the elements were Emblanium and Yakirum. 11. A hypothetical region of space time that cannot be entered from the outside, but matter and light can leave it. Essentially the reverse of a black hole. 12. Believed to be an organization or unofficial name for one, based on texts from GoI#03088 ("The Church of the Second Hytoth").